The ARES M4 CQB ARO 16 Airsoft AEG is the superb gun for gamers wanting with high performance and a metal gear box, that is at a value for money price It has a tough Nylon Polymer frame with metal alloy outer barrel & rail system. This is a very tough competitor, compact and take what ever is thrown at it. As M4's Go this is a beauty and great for either indoors or out in the field. Comes with metal gearbox, quick change spring and an electronic switch trigger.Make no mistake this is one of the best lower price guns on the market. Full metal quick change spring. Nylon Polymer,Metal Rail, Buffer Tube and the Outer Barrel. Will take a 9.6V Nunchuck Battery.Not in box. Inner Barrel length 300 mm. Length: 30.25" fully extended 27" compressed. The Amoeba AM-013 'Honey badger M4 Airsoft rifle. 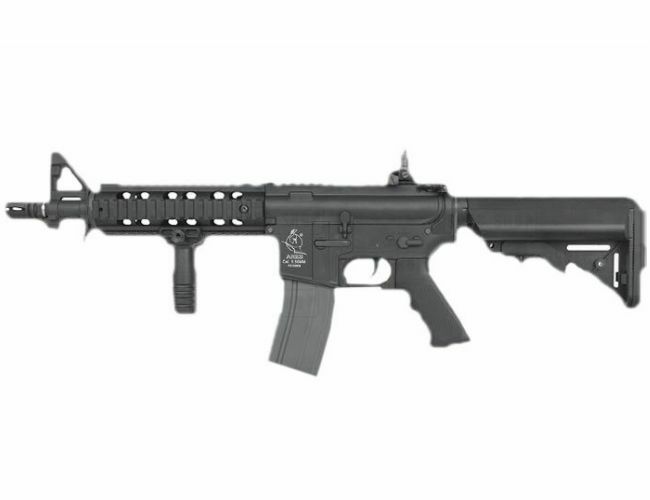 This is the G&G Combat Machine AEG CM16 SRS and comes with MOSFET & ETU.